is faux finished to look like it was made from old wooden planks. It is actually made of strong plywood and painted to look old. 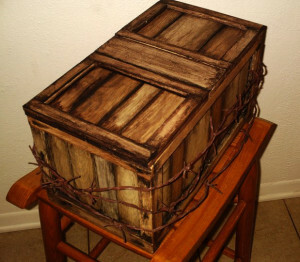 This crate was created for a magician. 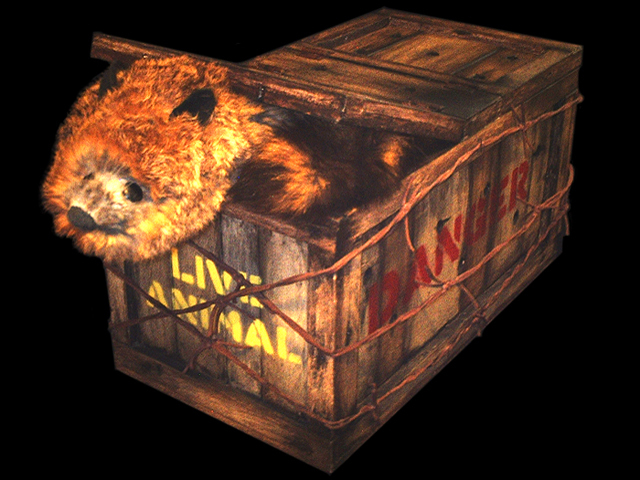 The animal crate plays prerecorded animal sounds that can be controlled via a remote control. The recording comes from a digital circuit inside with its own amplifier and speaker. The sounds can be changed and recorded over. There is also a spring system that can launch a Rocky Raccoon spring puppet into the air. The raccoon gets squished into a chute with a spring launching floor. Double doors are brought down on top and an arm is moved to hold everything shut. When the control is triggered, a motor moves the arm out of the way releasing the doors. The spring system along with the spring in the puppet, launches the spring puppet a good four feet into the air.